That was a quote from Bylsma during his press conference this summer, after his contract was extended as head coach of the Penguins. There's certainly a lot of irony in that statement. Bennett, a former first-round pick in the 2010 NHL draft, is an extremely talented winger on a team that right now, has literally zero depth at the position. They have James Neal, Chris Kunitz, Pascal Dupuis, and Beau Bennett. That's it. No I do not count Tanner Glass as depth. Bennett is the real deal, and if you can't see that, I'm not sure you know exactly what you're watching. Bennett can pass with precision, shoot from all angles, and handle the puck beautifully. On a side note, Bennett is the definition of a "Lady Killer". 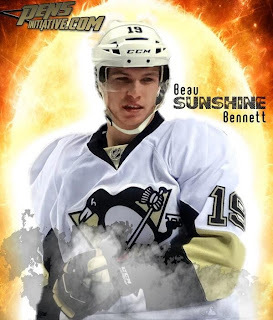 During his rookie campaign, Bennett produced 14 points in 26 games played, despite being a rookie, and playing in a limited role. Bennett mainly played on the third line and only averaged just over 11: 05 minutes of Time On Ice. Consider Bennetts' average T.O.I. was less than what Tyler Kennedy (14 points in 46 games played) averaged. Bennett was even more limited by Bylsma in the postseason, where he only appeared in six games, scoring a goal in the very first playoff game of his career. Bennett was playing on the first power-play on that goal, by the way. So Bylsma calls Bennett a top six forward, despite not using him like one at all last year. Will that change this year? In my opinion it absolutely has to. Like I mentioned, the Penguins only have four caliber top-six winger on this team, and Bennett is the only one of them that is a right-handed shooter. This isn't a very popular opinion but Bennett should actually play on Sidney Crosby's line with Pascal Dupuis, and the Pens should move Chris Kunitz back with James Neal and Evgeni Malkin, which was the most productive line in hockey during the 2011-2012 season. Bennett is not the only young Penguin that started to blossom last year. Another rookie, defenseman Simon Despres, really started to come on last year. Despres, 6-4' and over 200 lbs, is a physical and very skilled two-way forward. Despres played in 33 games during the regular season last year, averaging just barely over 15 minutes-per-game. Despres looked really good for a rookie, producing seven points, and finishing as a +9. More interesting was the fact that the Pens had a better winning percentage Despres in the lineup than they did when he was scratched for 13 games. In the same spectrum, the Pens allowed less goals per-game when Despres played than they did when he was scratched. That could be a coincidence but I don't believe in those. Despres certainly has the potential to be a top-four defenceman on this team and I think most would agree with me that he's ready to perform that role this upcoming season. Despres was playing very well last year as on the Pens' third defensive pairing but for some reason, saw his playing time cut severely in the postseason. Despres played in three games during the playoffs last year. Three. That's three out of 15. For some reason that only God knows why, the Penguins dressed Mark Eaton and Deryk Engelland both in more than twice as many games as Despres. Just makes no sense. Going into this season, I would play Despres with Kris Letang. Letang was at his best last year when paired with Despres, who compliments him very well. Playing with Despres will keep Letang more honest and make him play more responsible hockey in the defensive aspect of the game. That being said, with the signing of veteran Rob Scuderi, I highly doubt Despres will see top-four minutes which would be a mistake in my opinion. Bylsma harped on playoff experience as a reason for Despres and Bennett not playing in favor of less-talented veterans. I understand that, but allow me to play Devil's Advocate. How exactly are young players like Despres and Bennett supposed to be able to earn playoff experience if you don't play them in the playoffs? Now, going into this upcoming season, a season in which depth is a huge issue for the Pens, Bylsma should and will be forced to increase both Despres' and Bennett's playing time. The problem is they still really don't have much playoff experience. No offense to Bylsma, but I've seen more than enough young players, even rookies, perform well in the postseason. Facts are Bennett and Despres are just too good to keep off the ice. If Despres isn't playing in every game around 15-17 minutes per night there is a big problem. If Bennett isn't playing in a top-six role more often than not, along with seeing some real time on the power-play, then there's a problem. Also, do not play Bennett on the third line, I'm begging you Bylsma. The Penguins ruined Aleksey Morozov by doing that very same thing to him. Bottom line: Benett, with a full season playing in a top-six role, should produce very nicely, especially playing with Sidney Crosby and Evgeni Malkin. Despres should also be playing and contributing every night. The Pens have to embrace the amount of young talent they have. You can't keep guys as talented as Bennett and Despres out of the lineup because they're young, especially in favor of guys like Tanner Glass, Joe Vitale, and Engelland. That's literally a moronic thing to do. Bylsma and Ray Shero need to understand this and take a good look at the Chicago Blackhawks, who have developed a super good core, built around really young players. Youth, at least for this Pens' team needs to be served.